Lots of you have noticed the railing we’ve been using for tools and we’ve had a few inquiries about it. Sarai picked out the Fintorp system from IKEA to store our scissors and various small things. It’s made for hanging pots and pans, with little bins you can use for cutlery. But it also makes the perfect tool rack. We have so many little things such as chalk, fabric pencils, seam rippers and larger things such as rulers that really needed a good home. We used two rails, which fit together into one long rail. This has worked really well for us since we put it up! No more searching for the right pair of scissors or the eternally-hiding seam gauge. You can see that we’ve tied yarn to a few tools that didn’t have holes for hanging. You could do the same with pretty ribbons, lace ribbon or twill tape. Our studio is really coming along and there are only a few things left that we need to make it feel complete. As we continue to make changes, we’ll show you little peeks. I hope to give you a tour of the studio once we’re done decorating it! Boy do I need one of these! My costume studio is run out of my bedroom right now and mason jars (what I’ve been storing everything in) tend to tip easily. Thanks for the tip! I really like that system & I’m glad you finally shared what you’re using! I’m going to have to look into that for my craft room. I also picked up these rails at IKEA for my sewing room. They’re perfect. I never have to go searching for my marking pens anymore. Yeah, ours is a mixture of Ikea and vintage. It sure is a challenge to find affordable locally made storage pieces. Ah, the little buckets and things tied on string are genius! I keep the bottom rows of my thread racks empty so I can hang my scissors and tape measures and spare backs of bobbins and needles. Now I’m going to add a bit of yarn to my seam gauge and pens so I can hang them up too! The seam gauge and seam ripper are ALWAYS going missing on me. It’s kind of insane how often I lose them, but then I’m prone to losing things. Oh my garsh, you have my exact sewing machine. Isn’t it the bestest ever? YES. Love love love my Bernina. Such a great idea. If I ever have dedicated sewing space I’ll remember this! Great idea!!! I’m in the process of downsizing my sewing area…big time…I’m off to IKEA right now! Oh, I think I need an Ikea trip now. Most of my things are stored in a little sewing box I bought, or ‘hidden’ under my sewing space. I love those Ikea rails! Have 4 of them in my sewing room (except mine are from the Bygel line, which is not as nice looking as the Fintorp, but goes better with my decor). I ended up emailing this post to my husband the other day with “look at this!”, and he ended up surprising me by running to Ikea while I was still at work and hanging it up over my machine as a surprise for me. :) I think he must have been plotting how to keep all my scissors and seam rippers and things on my end of our office or something. ;) Anyway, I just put up pictures on my blog – it’s SO handy…. what a great find. My newly organized sewing nook says thanks for posting this! 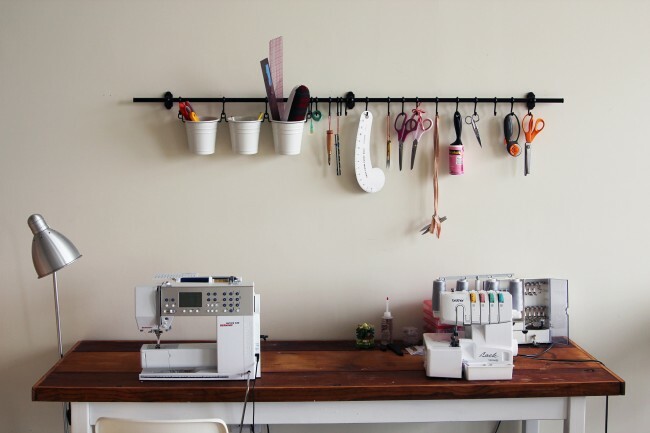 This is a great idea, even for a small sewing room like mine. It’s funny, I started my spring cleaning today. I still have one storage problem: since I’ve read it somewhere on you site, I iron my favorite patterns onto interfacing to preserve and re-use them a lot. However, most closets etc. are not wide enought to fit them in (flat). How do you storage these? Any thoughts? Have you thought about rolling them onto cardboard tubes, like those used for gift wrap or home decor fabrics? You could secure with a rubber band or a piece of ribbon/twill tape. Though, this idea is probably best used if you don’t have a LOT of patterns you’re preserving, as the tubes would take up a bit of space. I have a friend who was studying fashion at technical college, and he was taught to make a small hole in the pattern pieces, loop a rubber band through them (ie, using one rubber band to keep a whole pattern together) and then hang them from coathangers. The bar-and-hooks system is immensely useful in all sorts of hobby workspaces – I have one in my garden shed, too. But another great organizer for your sewing area is a wall-mounted magnetic panel, the kind you use for knives in the kitchen. Get some magnetic paint, buy little boxes with see-through lids (or sides) and paint them with the magnetic paint on one side/bottom – voila! Great storage for the tiniest things like needles, pins, chalk etc. What a great idea. I love it. I’m gone try get one for myself. Waw,!!! Not only looks great it is also practical. What is that case behind the serger? It almost looks like a case of machine feet, because it so, you need to tell me more about. I am ALWAYS misplacing my feet. I think I have bought 3 invisible zipper feet! Thanks for sharing this idea. It’s a good one! I was wondering where you got your table? I love it! I like the idea and may make a trip to Ikea. I think, however, that hanging sharp instruments like rotary cutters and scissors over a work area is hazardous. I’ve seen pictures of thread racks (in pictures of other people’s sewing rooms), and I’ve read about them, but I’ve never actually found one for sale to bring home with me. Any suggestions? 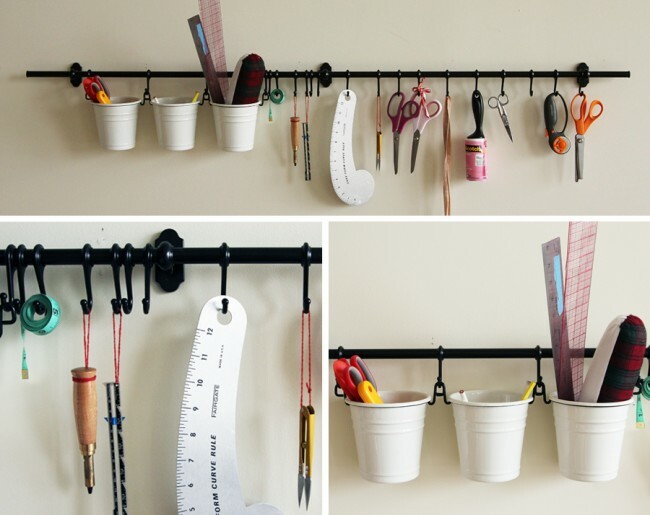 This is such a quirky and great way to make use of the IKEA kitchen organizer into your tool organizer. One of my staff at the self storage in Sydney was talking about this and suggested this to me when I asked her about my wife’s dilemma of organizing her tools for sewing. She pulled this out for me to see. I did not see the same organizer at the local store, but managed to find a similar system. My wife did some DIY design on the organizer so that it will look coordinated with her workstation.